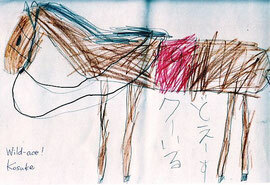 This horse was drawn by T who is a boy student of GB-class of LL Shihoya Arai School. He drew it his home and showed it to Yoshy. Looking at the horse, “Wild-ace” which looks happy and gentle; Yoshy was doing final checking of revised script, “Hane-Uma”, which is going to be performed at the 6th M-PEC Festival. The endings of this drama for the past three years were sad. Yoshy changed the sad ending into a little happy one. Let me express Yoshy’s great thanks to Ms. Chisato Kohara for her proofreading the final revised script. She is going to visit LL Shihoya Arai School his year, too to teach M-PEC members pronunciation in this Hane-Uma on Saturday, October 13th.